Lifehacker just rounded up the top 5 “best” places for computer parts. You might find yourself buying parts to either custom build your own computer or replace parts on an existing computer (either pre-built or custom). Why should you buy parts when you can get the whole computer off the shelf ready to go? People ask me ALL THE TIME what kind of computer should they get and my response is usually the same. If you want the cheapest you can get, go buy a pre-built machine. The Windows license alone (unless you already have one) is $100. You can get pre-built desktops for $200-300 fairly easily and there just isn’t any way to get good quality components for a whole computer for $100-200. There just is no way. Just don’t be real picky about what the pre-built can and can’t do. If you want a mid-range “bang for the buck” type of rig then it’s dependant on what you want to use it for whether it’s cheaper/better to build or buy pre-built. This is the zone where device manufacturers start getting some of their profit margins back, and start adding in things you may not need or use but charge you for anyway. If you have a good match between what you want and what the manufacturer is offering then pre-built is a winner. Otherwise, custom built wins. Midrange to me is a $400-800 machine. The closer you get to $800 the more likely a custom built will be a better buy. 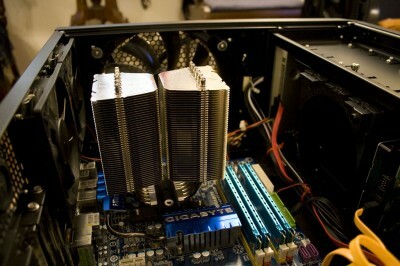 Prolimatech Megahalems air-cooling a Core i7. You won’t see this at Best Buy. If you want a high-end computer then you are definitely going to want to go custom built. If you need a specific solution like a photo/video editing rig or need massive amounts of storage or a gaming/3D rig then the difference is even larger. The issue with pre-builts in this case is that the manufacturers charge a HUGE premium for the high-end parts needed. A video card that costs $300 at a store will cost $600 from a manufacturer. A $100 hard drive suddenly costs $200. To get the top of the line CPU you need to also get a top of the line graphics card that you don’t need. If you go custom you can have full control over the parts and spend money where you need it. My #1 place to go shopping for computer parts is newegg.com. The selection is top-notch and their prices are hard to beat, especially on a good sale (and they have many). Their “Premier” shipping is like Amazon’s Prime service in that you pay a yearly fee for free expedited shipping (although Amazon offers more for their service). Returns are usually painless within their warranty period (I think it’s 30 days) otherwise you’ll be dealing with the manufacturer. The reviews are “usually” pretty good and at least give you a general sense of whether you’re buying a dud. The typical reviewer generally feels a little more tech savvy. The other place I go to (usually to compare prices) is amazon.com which will sometimes have a slightly lower price than newegg.com. I do NOT buy traditional hard drives (SSDs are OK) from here anymore since I’ve had issues with the way they package them (OEM versions anyway). They kinda put them in like a book and they slide all around the shipping box. Any other part that has non-moving parts or is in retail packaging should be fine. Parts are slightly harder to find because the UI for searching/filtering just isn’t geared towards computer parts like Newegg’s is. If you know the model# you want though a quick search will usually lead you to the right place. You’ll get more reviews from “normal” people who could skew the ratings, so I usually take amazon.com reviews on computer parts with a grain of salt and use reviews from other sites.